But few gain sufficient experience in Wall Street to command success until they reach that period of life in which they have one foot in the grave. When this time comes these old veterans of the Street usually spend long intervals of repose at their comfortable homes, and in times of panic, which recur sometimes oftener than once a year, these old fellows will be seen in Wall Street, hobbling down on their canes to their brokers' offices. Last edited by hdas on Wed Nov 21, 2018 12:09 pm, edited 1 time in total. Last edited by munemaker on Wed Aug 15, 2018 9:00 am, edited 1 time in total. I shall ignore the 110-year-old anecdote about alleged successes of unidentified "old veterans of Wall street" unless you can convince me that those venerable gents were investing in emerging markets index funds in 1908. Last edited by nisiprius on Wed Aug 15, 2018 4:28 pm, edited 1 time in total. Now Hear This: Load torpedo bay "EM"; Commence Market Timing at will. I shall ignore the 110-year-old anecdote about alleged successes of unidentified "old veterans of Wall street" unless you can convince me that those venerable gents in were investing in emerging markets index funds in 1908. He seems to have a been a bond trader, making him even more exotic: someone who invested in emerging markets government bonds that were denominated in the local currency! So based on this post, am I supposed to buy up Turkish stocks like crazy? The post mentioned nothing about Emerging Markets except in the title. Emerging Markets are what I call "Tiger in the Tank" investments, a high octane additive to give your investments more oomph. But these are risky and volatile investments, not like the Blue Chip stocks that old Wall Streeters load up on in times of crisis. Haven't their stocks already suffered enough? I bought 25 VWO this morning. I "went big" with 97 VWO split between two accounts (76 and 21) and 14 VSS. It was just a tiny bit more than necessary to get me back to my baseline. The 21 finished maxing out my wife's Roth for the year (with the odd cents going into VEMAX). I don't have grap0013's foresight, so I will probably rebalance all the way to his calling the next EM bottom. All markets were emerging markets until the Securities Act of 1933 in the US got the ball rolling on regulation of markets. CNYA and MCHI (Chinese equities) are both down over 4% in USD valuation. Other individual country EM equity indices are down less than aggregate EM indices in USD valuation. Edit: EZA (South Africa) is down over 5%. Last edited by Northern Flicker on Wed Aug 15, 2018 3:24 pm, edited 1 time in total. I hobbled to my computer, cane in hand, and rebalanced into VEMAX on Monday, just in time for EMs to drop some more. Gotta love 'em. I was going to say the opposite: no markets were emerging markets before 1981, because the term wasn't coined until then. But if he was investing in US bonds, that's pretty impressive, because in 1843, when Charles Dickens wrote "A Christmas Carol," US securities were apparently a byword for unsoundness. Where do you get your (current, I hope, updated daily/weekly) valuation information for EM value? Morningstar has data for funds like FNDE but I don't know how often they update each component of the ratios. Is there index level data? Fidelity has very good info and it’s up to date, using trailing rather than forward metrics on some. Based upon my experience with the "Nedsaid effect", I am sure they would dive soon after purchase. Your post reminds me of the old saying that the beatings will continue until morale improves. 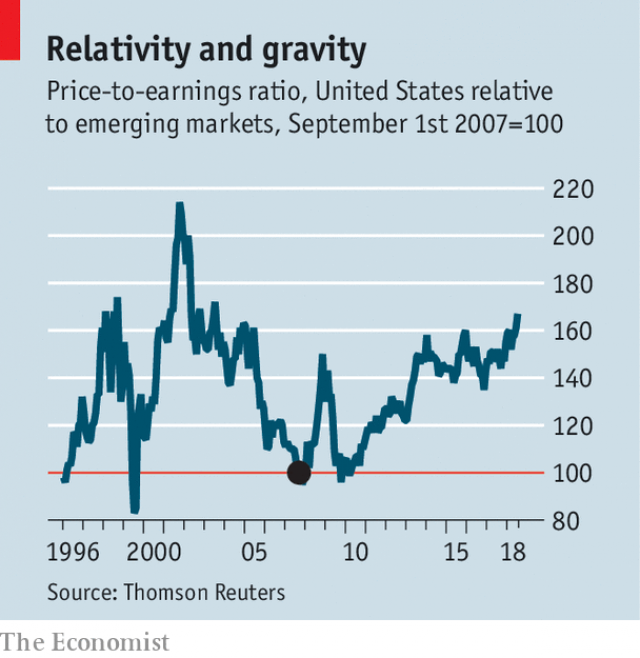 The Economist "The contrarian case for emerging markets"
FWIW, I’m at my target of 10% EM, so my post was to say that I’m not putting way more into something going down sharply but neither am i liquidating. Happily, I just increased my automated buys (raises) and will execute a buy of more SFENX today (Schwab emerging). It's been down quite a bit all year thus far. Thirty years ago in December, the modern exchange of scholars between the U.S. and China began. Since then, Chinese academics have become the most prolific global contributors to publications in physical sciences, engineering and math. Recent attempts by the U.S. to curtail academic collaboration are unlikely to change this trend. anecdote: I have yet to read a paper usefully informing my scientific field which has come out of China. I think this data doesn't contain enough signal to make any kind of tactical allocation, even if I were someone who did things like that. Pretty interesting chart. I may actually buy some EM. Probably need to rebalance anyway. But if I have to guess it will get worse before it gets better. Looks like they still have plenty of room to plummet. wow, really shows that for whatever reason markets participants' expectations are crashing through the basement floor with respect to emerging markets. i think those expectations are going to improve over the next few years. No doubt that hidden debt is a risk for China and we don't know accurately the full extent of the problem. Having said that it's important to recall that the greatest global debt default crisis since the Great Depression originated right under our blind eyes in the USA with the massive financial collapse of 2007-9. At no time in human history and in no country in the world prior to that were massive mortgages issued to homebuyers without any evidence whatsoever of asset base or income. All it took was a signature to gain access to hundreds of thousands of dollars. The banks that issued these toxic loans then quickly bundled them and sold them to others, both the US government and the financial industry. They were able to market them easily this because the US rating agencies for a juicy fee declared that a bundle of these sub-prime absurd loans was in fact a reliable high grade financial instrument. Then Wall Street saw an opportunity and created massive new derivative products based on the future performance of these underlying assets, hundreds of billions of dollars bet on this for of course more juicy fees. Of course it collapsed completely, but not one high executive in this long chain of profitable lies and misrepresentations went to jail. The result threatened the complete collapse of the worldwide financial system. And yet before it happened the entire US financial media, essentially all investment gurus, and the academic investment community--none of them noticed that anything was wrong. Instead they were typically awash with optimism. We should keep in mind that China isn't the only place in the world where dodgy financial things are done by those in positions of authority both in government and in the private sector. The CDO and the CDS had been around for a long time. The US mortgage system is founded on the Mortgage Backed Security which dates from the 1940s. Michael Lewis takes you through the history in The Big Short. There were a couple of innovations in the 2000s that supercharged it. One was a Chinese actuary at a Canadian university (Waterloo) who came up with an application of the Gaussian Copula - the joint probability of default of 2 mortgages. That allowed the Credit Rating Agencies to rate the things. Actually a number of people were sounding the alarm. Dean Baker at the Economic Policy Institute in particular. Meredith Whitney. There were others. Paul Krugman was talking about the housing bubble (but he points to Dean Baker as the earliest economic commentator to write about it). And there was Calculated Risk. Both Bill McBride who runs the blog, and the late Tanta who worked in mortgage securitization before she became ill.
which is a very interesting deep dive into the history of the underpinnings of the Alan Greenspan's ideology and deregulation. Also John Quiggin "Zombie Economics"
also called the crisis before it happened - that book is dated 2006. To rhyme with this, VWO up 2%+ as I write.